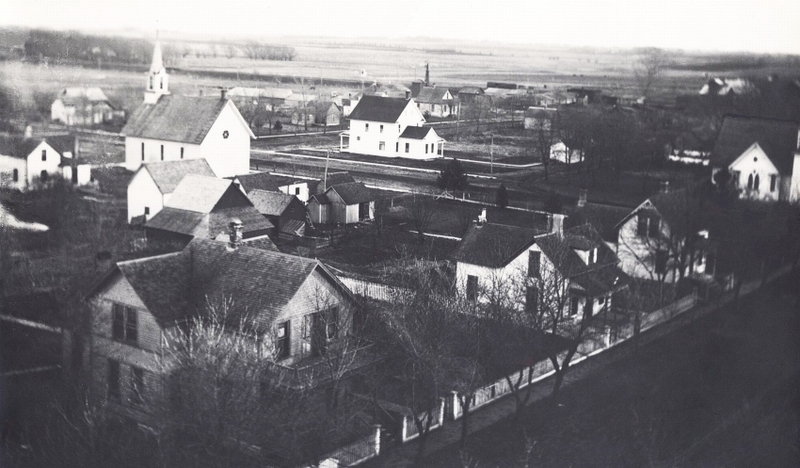 This early aerial view of Ellsworth (from about 1905) was taken from the Lutheran Church belfry. The image faces southeast. The large church to the left is the Methodist Episcopal Church, recently the site of Roger Abell's home. Just visible on the right is the Congregational Church, which is currently known as the Ellsworth United Methodist Church. 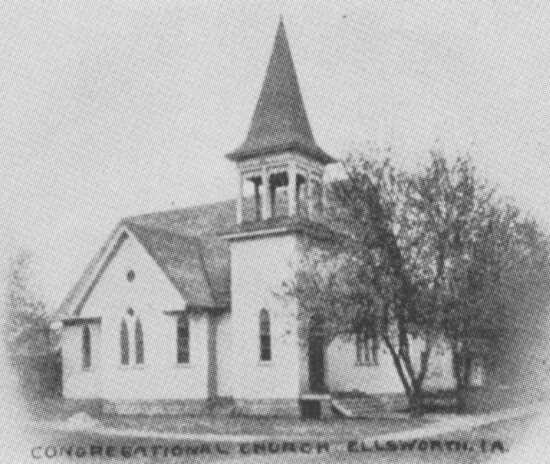 The Methodist Episcopal Church of Ellsworth was built in 1883. The land was purchased from the Western Town Lot Company by the trustees on July 14, 1883. The church building was located on the northwest corner of the Dayton Street and Des Moines Avenue intersection. The church was a very plain one inside. It had bare walls with wainscoting four feet up the wall from the floor, then four inch boards up and down to the ceiling. A big round stove was the only heat. Later when electricity was generated in town (1910), electric wires hung from the ceiling. The pews were old fashioned and few, as the congregation was not large. Windows were long and narrow, with the door on the east. A tall bell tower over the entrance was topped with a weathervane. One electric light stood outside on the corner. Hitching posts were located on the south. Wood sidewalks were on the south and east. The church was very plain on the outside and was built directly on the ground. The pulpit was on a platform in the west end and there was a pump organ and a table for hymnals and Bibles. Everyone who attended church activities and who donated money towards expenses were considered members. No records of church membership from this period have been found, however a record book of the 1896-1897 Lincoln Township Sunday School Association which met in the church exists. 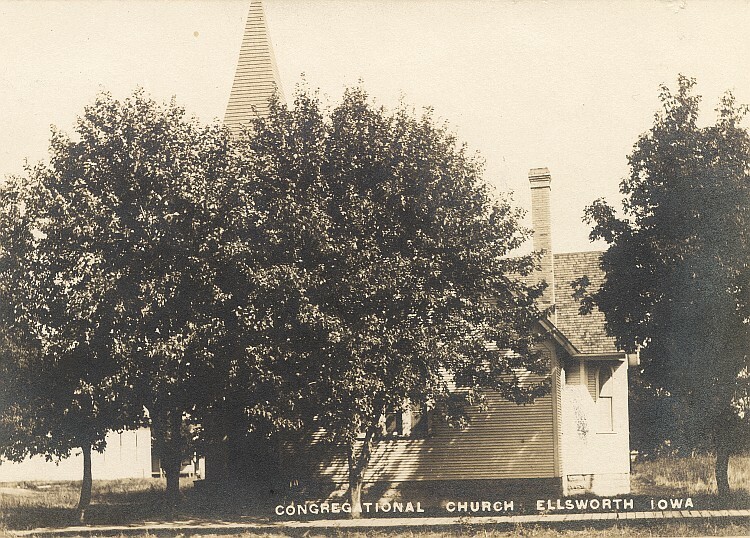 The church building which is now known as the Ellsworth Methodist Church at the corner of Des Moines and DeWitt Streets was built by the Congregational congregation in 1903 and granted a 50 year charter that year. 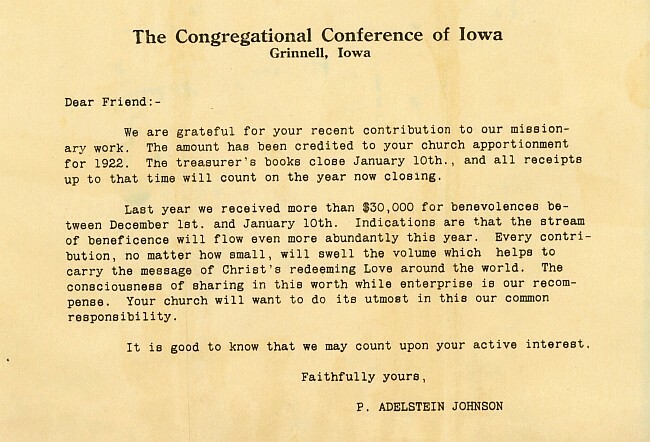 The State Bank of Ellsworth issued the deed to the land, and the church was dedicated in December. Ellsworth's United Methodist Church (originally the Congregational Church). 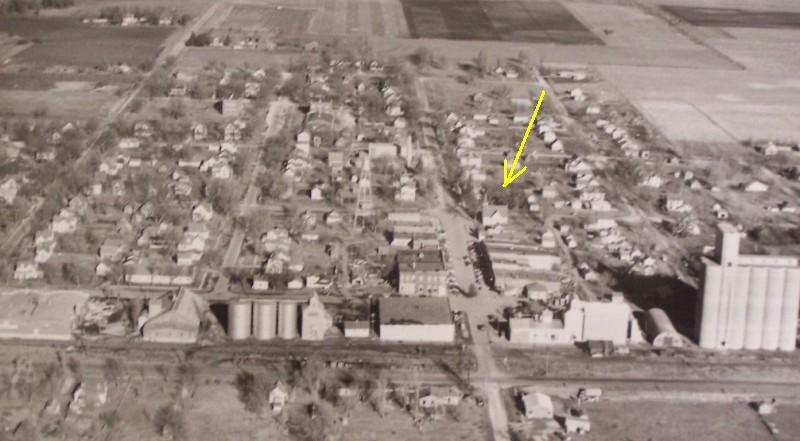 Notice the wood sidewalk and the chimney location which differs from today. There are just a few front steps because there is no basement. This image is from a 1908 postcard which says, "This is where I go to church. Isn't it a nice little church?" The building visible behind the trees at the left of the photo is the Methodist Church. In 1912 the congregations of the Methodist Episcopal Church and the Congregational Church began meeting together with the name of the Union Church. The Congregational Church building was used for Sunday meetings and weddings while the Methodist Episcopal Church building was used for suppers and Ladies Aid meetings until 1923 when a basement was dug for the Congregational Church building. 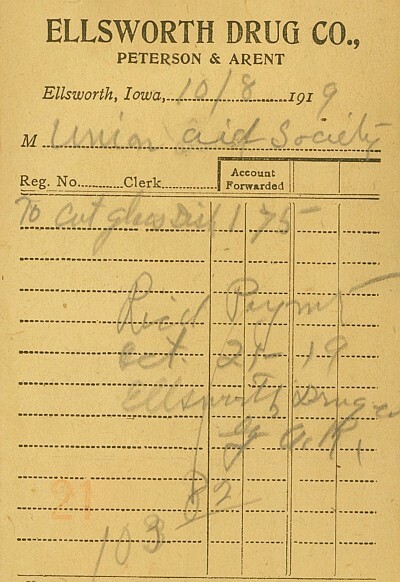 The invoice at left shows the purchase of 70 cut glass dishes in 1919 by the Union Ladies Aid Society. The digging of the basement was a major improvement which was accomplished largely by members of the congregation and community. Abel Ahrens dug with a huge shovel and his mules. The opening was made on the north side and the excess dirt was used for filling holes throughout the town, especially in the east part where there was a swamp. The basement now offered the Union Church needed space for dinners and informal meetings, so the Methodist Episcopal Church building was no longer needed. 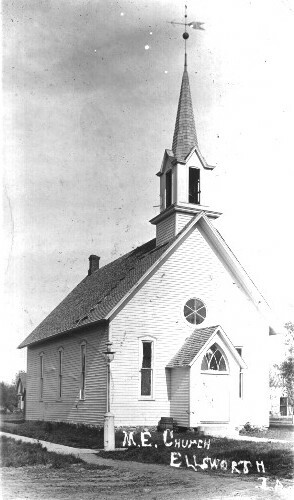 It was sold and moved five miles southeast of Ellsworth and renamed the Bethany Lutheran Church. Roger Abell's home recently occupied the location vacated by that original 1883 Methodist Church building. November 4, 1920:The old M.E. church building that has been standing idle for the last nine years has been sold to a Lutheran church society near Randall. The work of moving will begin at once. It was thought that accurate membership records should be kept, and under the leadership of Rev. Bottom (1922-1926) 38 members reconfirmed their faith and pledged themselves to the church. Since that time permanent records have been kept. The bible on the altar in today's Ellsworth UMC chapel came from the old Union Church.